A new DA has been submitted for 120-124 Lutwyche Road, Windsor for a mixed use development including apartments, hotel, office and retail. 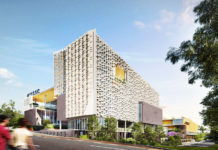 The development is located within the Lutwyche Road Corridor Neighbourhood Plan which allows high density development along Lutwyche Road and the Northern Busway transit corridor. The hotel tower consists of a rooftop restaurant, bar, pool and function room. Designed by Sparc Architecture, the development sits on a 3,833m2 site which currently houses industrial warehouses. 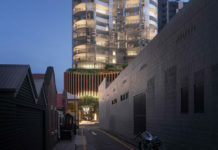 The proposed development includes a 121 room hotel, which is anticipated to assist in meeting the need for short term accommodation associated with the nearby Royal Brisbane and Women’s Hospital, a small café, and a high density residential uses. The hotel component of the development deliberately addresses Lutwyche Road to provide commercial uses to this frontage as intended by the Neighbourhood Plan. The café use at the ground level of Building R2 will provide significant activation to Nicholas Street. The DA number for this development is A004104155.